If you need some sunshine in your life, Jeremy is just the little character who will constantly make you smile. He loves to play in the water! Jeremy is an adorable 3 month old puppy that we believe to be a lab/hound/shepherd mix. We do not do DNA testing. You would need to have the test completed to be completely sure of his breed. This friendly little man is an affectionate companion would would love to go everywhere with you. Jeremy currently weighs in at 30 pounds. We expect him to be 60-65 pounds when fully mature. Jeremy gets along well with other dogs and dog savvy cats. He is crate trained and house broken. He is eager and ready to learn new things. Jeremy is up to date on all of his vaccines. He has not yet been neutered due to his young age. If you are looking for a companion to be at your side, Jeremy is sure to turn heads wherever your adventures take you. 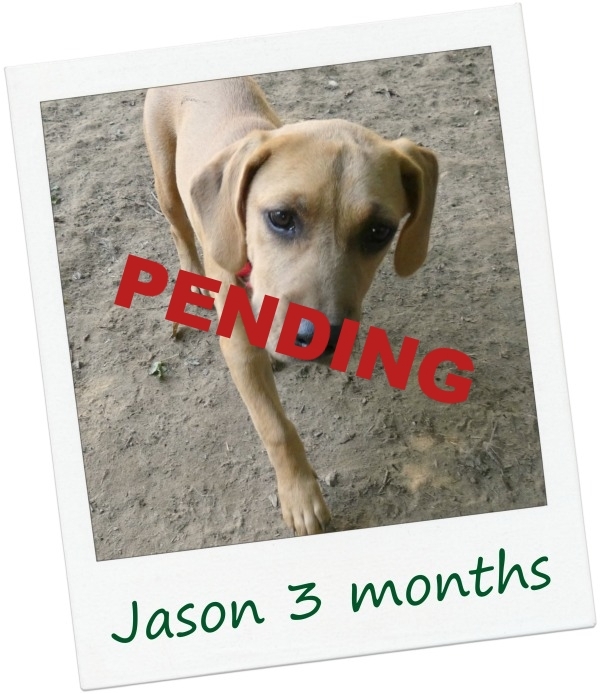 * Based on current veterinary recommendations, Jason & Jeremy have not been neutered due to their young age. We do require proof of this procedure at a later date as part of the terms of our Adoption Agreement. Please discuss the correct time for this to be done with your veterinarian. We can provide a $75 rebate once the procedure is completed. At only 12 weeks, Jason is starting to toddle and play. Brimming with puppy enthusiasm, he is ready to move on to his new forever home. We do not do DNA testing, but we believe this handsome guy is a possible lab/hound/shepherd mix. Jason is already 30 pounds. We expect him to be 65-70 pounds when fully grown. Jason gets along well with other dogs and even dog savvy cats. He is currently working on being house broken and crate trained. He is the perfect age to learn many new skills. He spends his days playing at Sleepydog Kennel in Colchester where he has a great time and gets thoroughly exhausted. Nights and weekends are spent with his foster mom. Jason is up to date on all of his vaccines. He has not yet been neutered due to his young age. If you are looking for an affectionate, devoted companion who would love to go everywhere with you, Jason is your perfect match.